You may be surprised to learn that some seemingly harmless goods can be dangerous on board an aircraft. An aircraft is not an automobile. In flight, variations in temperature and air pressure can cause some items to leak or ignite, so.. 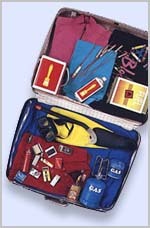 Such items are forbidden in baggage because they may ignite by friction. Fuel, paints, solvents, adhesives, and flammable gases such as lighter refills and camping gas might leak and cause a fire. Signal flares and other explosives might detonate because of their sensitive nature. Bleaches, drain cleaners, many aerosols, mercury and solvents contain dangerous chemicals which can cause toxic fumes and corrosion. Carrying dangerous goods aboard an aircraft is an offence and may be subject to penalty. Consult your airline for further details.